A latex coated glove with a seamless cotton/polyester liner designed for cooler conditions. The mixture of acrylic/cotton/polyester in the liner combines warmth, light weight and suppleness. The natural rubber coating on the palm and fingertips protects the hand from abrasion, cutting and puncturing, and prevents the glove from tearing. The rough finish allows slippery objects to be gripped firmly. This is an ideal glove for all work in cold and damp outdoor conditions. The ventilated back of the hand reduces perspiration. 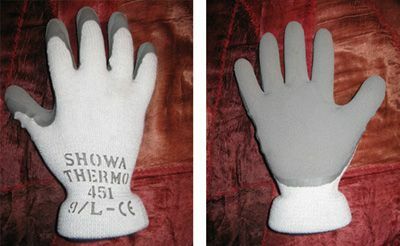 The glove's anatomical shape facilitates movement. The seamless liner prevents irritation. The gloves are held in place by elasticated cuffs. Can be washed at 40°C.